LONDON (Reuters) -- PSA/Peugeot-Citroen's talks on a 3 billion euro ($4.11 billion) tie-up with Dongfeng Motor are progressing more slowly than the troubled carmaker had hoped, sources with knowledge of the matter said after negotiators returned from meetings in China. PSA now hopes to sign a non-binding outline deal with its Chinese partner in late November at the earliest, a month later than it was expecting as recently as last week, the sources said. A deal could then be inked early next year. A PSA spokesman said the company had nothing to add to earlier comments on the talks. It has confirmed it is seeking a deeper tie-up with existing partner Dongfeng or another carmaker. 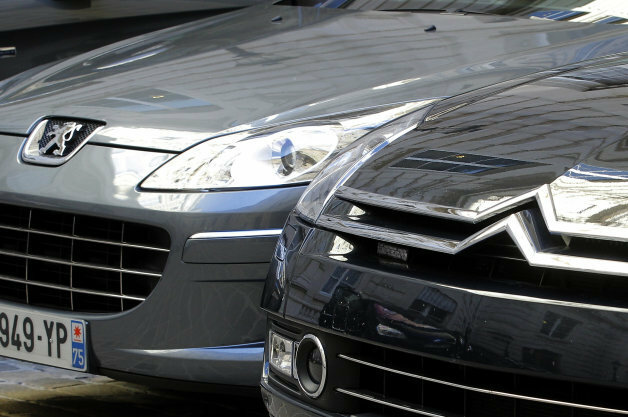 PSA is hoping to raise as much as 3 billion euros in a capital increase in which the French state and Dongfeng would each take a 20-30 percent stake, Reuters first reported last week. PSA executives, officials from France's APE, the agency in charge of government holdings, were part of a delegation that attended key meetings with Dongfeng in Beijing on last Saturday and Wednesday, the sources said. The talks were not as productive as expected because Dongfeng is not in a hurry to invest in PSA and is playing hard ball on price, the sources said. PSA is meanwhile pushing ahead with efforts begun in May to sell off part of its Banque PSA car loans division, said four people familiar with the talks. Europe's biggest car financing player Santander is reviewing a bid to acquire 50 percent of Banque PSA, which is worth about 3 billion euros, the sources said. Other contenders are interested in operations in specific countries. UniCredit and Commerzbank could be interested in acquiring Banque PSA's business in Germany, sources familiar with the talks and sector bankers said. Lloyds could look at its UK business and Credit Agricole at the French one, the sources said. It is not yet clear whether a successful share issue to Dongfeng and the French state would remove the need for a spin-off of the financing arm, they said. While a capital increase could relieve pressure on BPSA's credit rating and financing costs, a partial sale of the unit could help win EU clearance for the planned government cash injection into PSA, they added. Santander, UniCredit, Commerzbank, Lloyds declined to comment. Credit Agricole was unavailable for immediate comment.